White House drama The West Wing will end its seven-year run on US TV network NBC in May. The political saga has suffered a ratings slump since it was moved to Sunday nights. NBC entertainment president Kevin Reilly said the decision to cancel it was made before actor John Spencer died of a heart attack in December. He said: "There's a point where you look at the ratings and you just say, 'it's time.'" 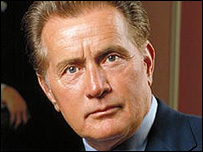 The West Wing, starring Martin Sheen as fictional US president Josiah "Jed" Bartlet, won the best TV drama Emmy four years in a row. It also holds the record for most Emmys won by a single series - nine trophies for its first season. At its peak The West Wing - currently showing on digital channel More4 - was one of US TV's most popular series, but the much-praised drama has struggled to maintain its place in the ratings. The current season made its debut with 7.6 million viewers as the show moved to a Sunday night time slot from Wednesdays - down 10 million viewers from its peak. Spencer, 58, played Leo McGarry, chief of staff to the US president on the hit series. NBC plans to screen a one-hour retrospective of the show, including a tribute to Spencer. The network will bring its run to an end on 14 May - four days before it also pulls the plug on comedy Will and Grace.